THis chopper is a rare bird, and ugly too. Previously purchased by a fellow collector from an old man, who stubbornly held his price knowing her rarity, this Sprint GT is only one of less than a handful left in Singapore. I purchased her several years ago and took a year to complete this refurbishment project. She now has mostly new-old-stock parts and over 25 coats of automotive wax on her frame. To keep her deep, rich patina and authenticity, I chose not to respray the frame and fork, and left the beat up Raleigh Heron headbadge as it was, devoid of paint and with a nasty gash across it. Luckily, I got my hands on NOS Raleigh pedals, a NOS Sprint GT seat, replaced the shifter with another NOS set locally, and even found a pair of Sprint GT brake levers on eBay UK. They aren't the normal Chopper pieces, and are shaped in a curved manner, this was developed specifically for the Sprint GT. I rechromed the mudguards, and also replaced the incorrect front rim with the correct-sized chrome Rigidas -16"x1 3/8 - along with the tyres to match. The correct rear tyre would have been a smooth 20"x1.75 redline piece, but seeing how it was close to impossible to get the smooth tires, I settled for repro Chopper redlines of the same size. The final touch was to accessorize it with a NOS Sanyo speedometer. Incorrect for the bike, but who cares, it’s a period piece that looks totally '70s. A money pit, but it gives me such a kick to know how rare this baby is! 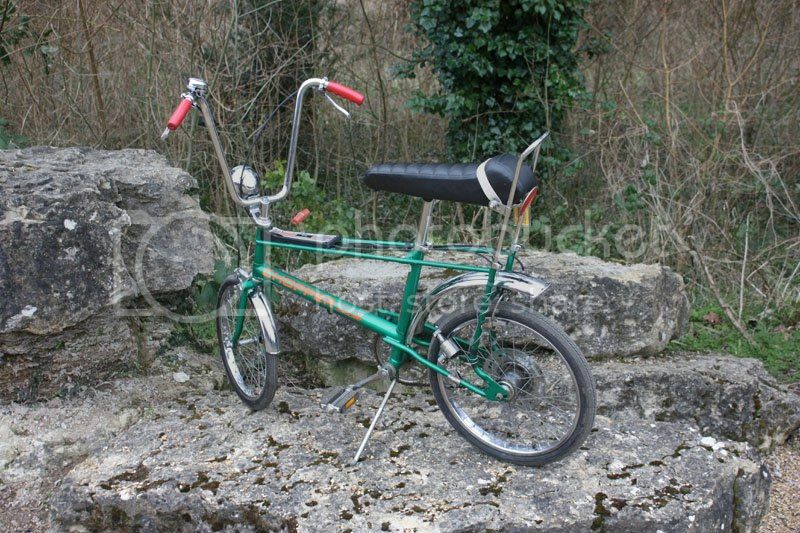 A sales failure in the UK, Raleigh only made these for a year or so, then it was discontinued. Like in the UK, far fewer Sprint GTs were sold in Singapore compared to the regular Mk1 and Mk2 Choppers. Many had their handlebars swopped out for ape hangers to make them more palatable to buyers. I am lucky the original owners had the good sense to keep the 'rams horn' drop bars! While I still think it’s an ugly bike, its the most eye catching contraption of any kind I've ever owned. This is a rare bird indeed. Weird, but I personally like the handle bar. Makes me want to start a Chopper build so badly. Wow, this is not what you usually see on the road. I must say this, indeed is a good find. The main differences between a normal MK II and a sprint is the frame has a taller fork stem making the frame taller. The handlebars are drop type. There are no springs on the short sisseybar, it is ridgid. The gap between the bottom of where the springs should be and the rear mudguard is larger. The fromt wheel is thinner and the front mudguard is longer and thinner. The seat is different too. Thats why there is no rack because if you try th fit a MK II rack the lower stays wont reach the brake bridge because its about 5 cms lower. The frame also has a little lug at the front forks because when fitted with the drop handlebars, if the front wheel and handlebars turned around too far the end of the drop bars would hit the gear shifter and damage it. The little lug stops the front forks turning more that abot 70 degrees. The brake levers were a different shape too. This bike has normal handlebars fitted by the owner to make it easier to ride. Hoover5Ken, you really know your stuff. Hi, is your Raleigh chopper still avail?